Click the button above to watch an instructional video on how to select the correct size EponaShoe for your horse. Please note that the computer programme METRON is no longer available or supported by EponaShoe and we do not have any copies to circulate. The information about METRON has not been removed from the instructional video. Example below of the use of EponaShoes in the recovery of a foundered pony. 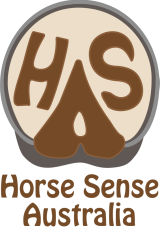 Horse Sense Australia stocks and sells EponaShoes - because they are vital to the rehabilitation of our rescue horses that come from founder and laminitis, navicular and Equine Metabolic Syndrome (EMS) type backgrounds. 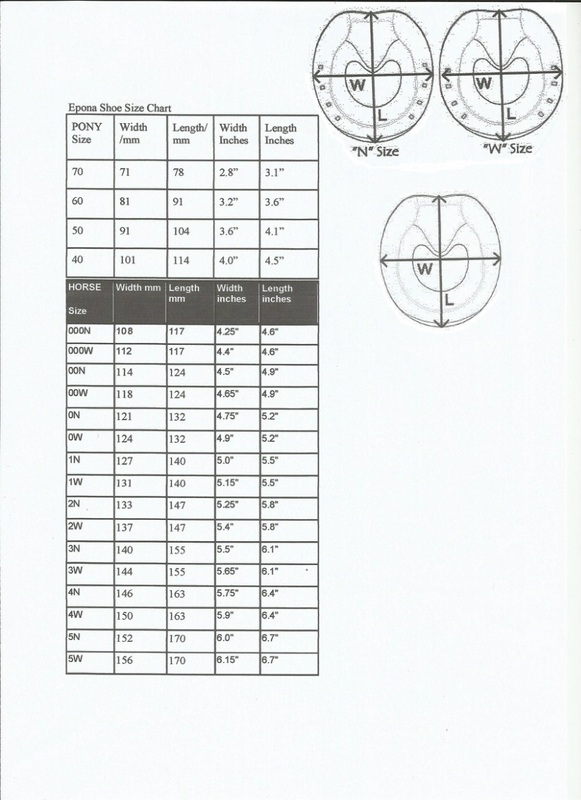 The EponaShoe sizing gauge makes selecting the right size of EponaShoe for your horse easier than ever. Just hold the clear plastic template up to the bottom of the hoof & you will instantly know what size EponaShoe to order. This chronic laminitic, lame horse is shod with Epona shoes that have been glued and cast onto the hoof. This gives protection to soft soles and support for weak hoof walls. 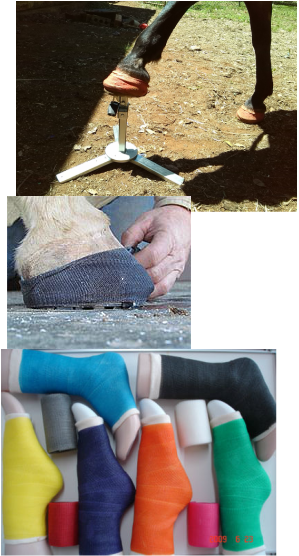 Casts come in a range of colours - bright colours such as orange, red, green, purple, pink, blue, yellow or more discreet colours such as black and grey that are hardly noticeable on black hooves. 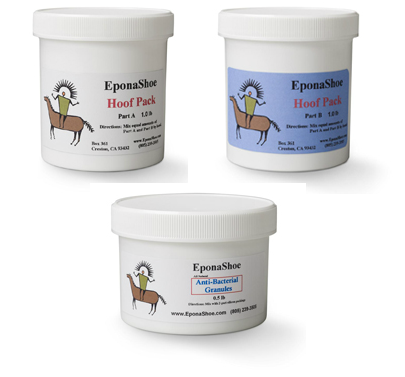 EponaShoe is the premier composite shoe for the health and longevity of your horse. The lightweight construction of the shoe allows the horse to move with more natural biomechanics. EponaShoes - flexible, frog support, sole protection, provide horses the opportunity to develop sole and to de-contract their hooves through movement. Nails can but do not have to be used to successfully attach the shoe to the hoof wall. Horse Sense Australia uses Optima Casts and glue to affix EponaShoes to the horse's hooves. In this way, the EponaShoe becomes a glue-on shoe. We have had excellent results using it in this way. Horses that have been extremely lame from founder and laminitis have been especially helped by the application of EponaShoes. Making sure your performance horse is comfortable and has the best care possible starts from the ground up. EponaShoe offers unmatched frog support and flexibility. Shock absorption from the special polymer blend is easier on the horse’s joints, extending the riding career of the performance horse. More videos on applying EponaShoes will be placed here. Choose the smallest size shoe that is slightly larger than the periphery of the hoof. The excess can be ground/rasped down. ﻿The use of Casting Hooks eliminate the need to have the casting material go underneath the shoe - hence the shoe’s traction is preserved and the casting material is not worn away on the underside of the shoe. ​EponaShoe’s test horses were able to keep the cast shoes on for a full 6 week shoeing cycle. Casting Hooks are extremely easy to use. Simply press the hooks into the nail holes, and if needed, tap in with a hammer. 2 or 4 hooks (or possibly more) may be used depending on the situation. The hooks are tapped in place and then the hoof is cast from the ground up, but not going underneath the shoe. Available on our store's website. This glue must be purchased directly from USA. Our store is not licenced to import it into Australia. We import the glue gun and tips. Equibond has been used for years to apply horseshoes. 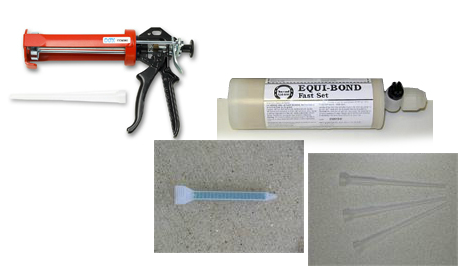 Equibond is a two-part acrylic glue. A special "gun" is needed to apply the glue. Mixing tips screw onto the glue tube and mix the two parts as they come out of the tube. Use gloves and work in a well-ventilated area when using the glue. EponaShoe packing is a silicon-based two-part formula that can be mixed by hand. 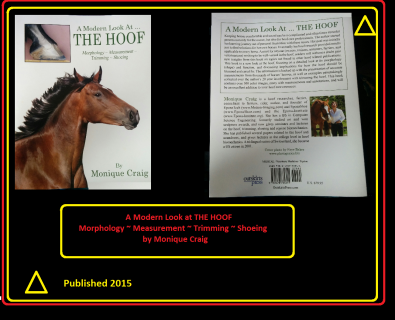 It has been "tuned" for the job of providing sole support for horses, especially when used with the EponaShoe. Using this packing under the EponaShoe forms a "gasket" and no rocks or other debris can get between the shoe and the sole. We also sell all-natural Anti-Bacterial Granules which can be hand-mixed into the packing to aid in suppressing bacterial growth under the hoof during the shoeing interval. This helps to prevent thrush proliferation underneath the Epona shoe. End result (different padding colour, same result). This Eponashoe is nailed to the hoof. 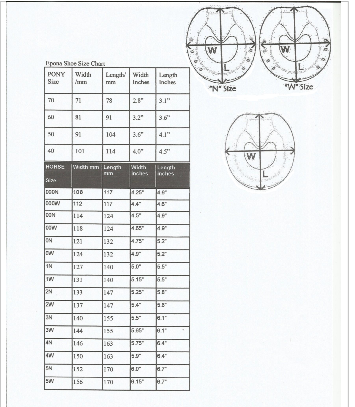 Please check hoof measurements against the adjacent chart which will assist you to make an accurate size selection for your horse. 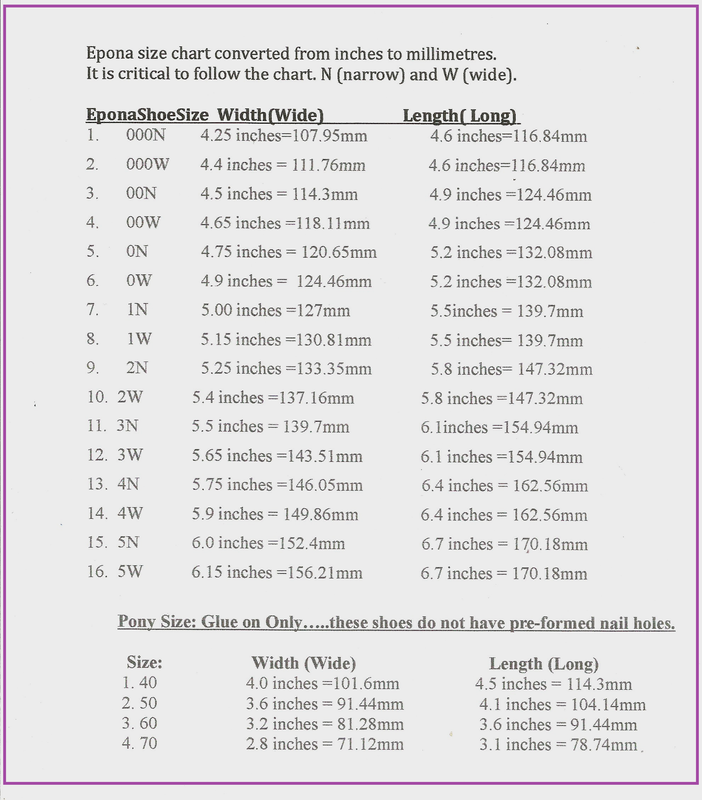 All EponaShoe HORSE shoes have a sizing letter - either and W or an N beside the number. eg 2N or 3W . 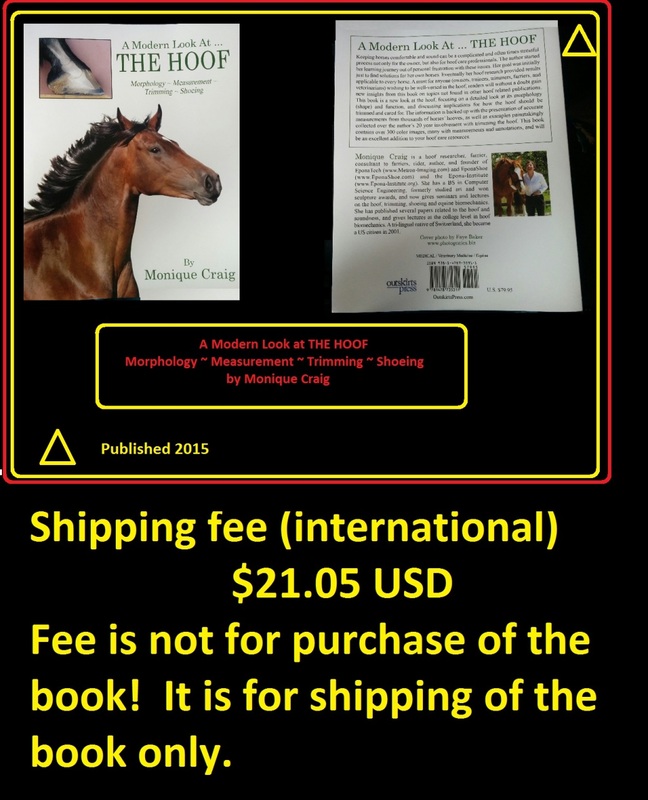 Default shipping is $30.00, but actual shipping costs for this book are $51.05.05 USD. 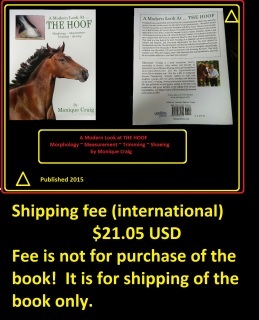 If ordering the book, please select this product (shipping invoice) to cover the international shipping fees.